Air line lubricators are devices used to provide lubricant to a compressed air operated air tool or compressor air driven equipment. They do these by being installed either at the outlet from the air compressor as part of an FRL, or further along the air plumbing near equipment needing added lubrication. Air-line-lubricators usually contain the following parts: the head, an adjusting screw on the head, a bowl to contain the lubricant, and often a bowl drain to allow removal of the lubricating oil when needed. In the top of the head of typical air-line-lubricators a small, transparent housing, can be seen. This housing will have an adjusting screw on the top. Turning that adjusting screw will increase or reduce the frequency of drops of lubricating oil . The oil drops fall into the air stream flowing through the lubricator head and out into the air line. Depending on the air pressure and volume of air passing through a specific air lubricator, the drops of oil can be atomized into smaller air drops that can flow down the air line some distance. The housing is transparent so that, as you adjust the flow of oil via the flow-adjusting screw, you can monitor the frequency of the lubricating oil drops as you adjust the flow. Identification and descriptions of the various lubricator components follows. Item 1 in the image identifies the adjusting screw housing. Item 2 is the lubricator head itself. Attached to this head will be a bowl that contains the lubricating oil. The bowl will attach to the head with a bayonet style mount or it might be threaded on. Care must be taken to ensure that the air line, and the lubricator bowl, is void of compressed air before attempting to remove the lubricator bowl. A lubricator head will typically have an arrow on it displaying the required direction of air flow through the lubricator. You can see the one on the head of the lubricator in the photo. In the lubricator head there are ports to which the in and out air lines are attached, usually by a threaded fitting. However, some lubricator manufacturers have modular connecting ports that quick change, allowing one lubricator body and head to be used for a number of different port sizes by simply swapping out the modular connector. Item 3 in the picture above is a sight glass to allow an operator to check the oil level in the bowl without having to remove it. Item 4 is the lubricator bowl, this one without a drain at the bottom. As the air passes through the lubricator head the air path is reduced in size. This results in an increase in the speed of the compressed air through the lubricator head. In the narrow part of the lubricator head is an outlet for a small tube that extends from the head down into the oil inside the bowl. Air passing through the venturi inside the head creates faster moving air moving past the orifice to which the small tube is attached. This reduces the air pressure in the oil feed tube creating a partial vacuum, and this vacuum draws oil from the bowl up the tube. The oil travels up the tube from the bowl, through the transparent housing, past the flow-adjusting screw, and then drips back down into the air stream as long as the air is flowing through the lubricator. Depending on the style of the venturi and the speed of the air, the oil can be completely “atomized” (reduced into fine droplets), or atomized to differing degrees. This atomized oil is carried out of the lubricator head in the compressed air stream and, providing the lubricator is placed close enough, downstream to the air tool or air component needing lubrication. There are a number of different styles of lubricators, from a number of different manufacturers. While many of them will function similarly to others, some will atomize the oil even more than others, turning the oil drop into a finer mist or fog. Fog type lubricators claim to be able to lubricate air tools and other devices at a much greater distance from the lubricator than other lubricators that do not atomize the oil as finely. 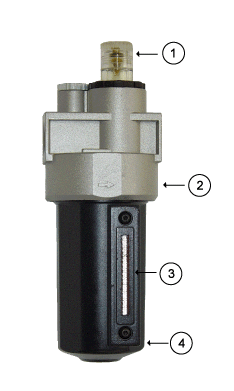 Often an air line lubricator is installed in an FRL (Filter – Regulator – Lubricator) set which may be quite some distance from the equipment to be lubricated. The oil-carrying-air has to travel from the lubricator to the application, sometimes through an air valve – without the oil dropping out of suspension. If the oil drops out of suspension in the air line, which it will do if the distance is too far, then after a while, in a low slung line, the oil will coat, accumulate and eventually could completely fill the air line. In time, once the air line becomes completely blocked, a great slug of oil will be blown downstream to the exhaust port of the valve where it will leak all over the floor. Or, that slug of oil will drip out of the exhaust of the air tool and yup, it will now leak all over the floor there too. Different manufacturers claim that their lubricators will atomize the oil to different degrees of drop size, so that oil carries farther using their lubricators than those of other manufacturers. Be aware of the distance from the air line lubricators to the air tool being lubricated. It is important! Rule of thumb: Keep the general purpose lubricator with 2-3 yards of the item to be lubricated. If you can’t locate it that close, it’s possible that little or none of the lubricating oil will reach the air tool. Rather, the oil will simply drop out in the air line between the lubricator and the tool. The amount of oil drop out depends on the distance, the volume of air flow, and the frequency of air moving through the lines. Be aware of this issue, please. Please note the order of the letters in the acronym F-R-L. The letters are in this order on purpose. First comes the Filter, then the Regulator and then the Lubricator. Putting the lubricator before the filter will simply fill the filter bowl with oil, and none will get downstream. And, you don’t want oil flowing through regulator either, so the lubricator should always be downstream of the regulator which is always installed after the filter so clean air can flow through that device too. Many air valves and air cylinders come from the factory well lubricated for the life of that item. It’s only in really high cycles that lubricant may need to be added. Check with the cylinder or linear slide manufacturer for lubricating requirements for their tool. An error will lead to maintenance issues before their normal use cycle would indicate. If a lubricator is installed in an air line feeding items that are already factory lubricated, this results in the new oil tending to wash out the factory lube, and from then on, you will then have to continuously provide external lubrication for the life of the item. Check with the vendor of that air tool or component to be sure if it needs additional lubrication. Air tools that have high use rates usually need external lubrication. You can plumb a small lubricator a few feet (one meter or so) up the air line from the tool, ensuring that lubricant is getting to the air tool as needed. Air tools used infrequently, and for short periods, can normally be adequately lubricated by dripping 2-3 drops of air tool oil into the in-port of the tool just before use, and then another 2-3 drops with a quick burst of air before putting the tool away until next use. When I used to sell lubricating oil for air line lubricators, by the multiple-gallons, I might add, it was always a light, air tool oil. Visit the OIL ISSUES page on this website to find links to recommendations and to a short video about compressor oil. Although there is another page on this site that has the air line lubricators forum, I have added a form here so that if you have a question you can add it here instead. Comment or Question about Lubricators? Please post it using the form below along with photos to help others help you.